I saw this miniseries (based on Dickens’ final novel) a while ago, and was VERY impressed by it! There is glam, grit, unconventional romances, and many quirky characters. There are several plots intertwined. The stand-in for the viewer (or perhaps the author) is level-headed gentleman, Mortimer Lightwood (Dominic Mafham, pictured right). 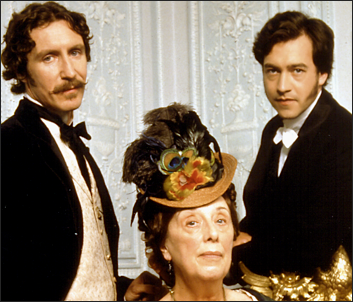 Though the entire cast is strong, the standout actor is Paul McGann (pictured left w/ mustache). This is b/c his interpretation of aimless gent Eugene Wrayburn, who falls deeply (and unexpectedly), in love is SO natural. The voice, snobbery, and swagger show that he has BECOME the character. Eugene and Mortimer are both barristers and best pals, though Eugene is not interested in furthering his career. He’s dissatisfied w/ life- searching for some purpose. Lizzie Hexam (gorgeous Keeley Hawes) is a shy beauty who works w/ her father on the Thames River. They search the water for dead bodies- YIKES! She saves up to send her younger brother Charley to a decent school, realizing that the slum is no place for a bright boy like him. 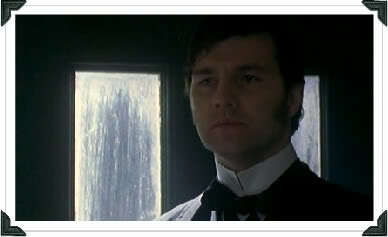 Hawes can convey LOT w/o speaking, as this role demands. While Eugene starts out carefree, quiet and serious John Harmon (Stephen Mackintosh) has a definite plan when he comes to London from the West Indies. His dead father left him a fortune; he also had plans for his personal life- an (arranged) marriage. John says his last name is Rokesmith, takes a job as a humble secretary to Mr. Boffin, who made his fortune from dust heaps. (Yup, that’s historically true!) John finds a room to rent from the humble Wilfer family. Though Bella Wilfer (petite/fiesty Anna Friel) was born poor, she yearns for more. She doesn’t like the idea of the arranged marriage to a stranger, BUT likes the idea of being rich. Like Eugene, Bella (a “Daddy’s girl” w/ a sense of entitlement) changes her character over the course of the story. Friel fits her role VERY well, showing different shades of a young woman in (and out of) high society. Fans of tall/handsome David Morrissey (recently seen on South Riding) may be surprised to see him cast as a VERY jealous/repressed baddie here. He plays Bradley Headstone, a teacher at a boys’ boarding school who develops a dangerous obsession.